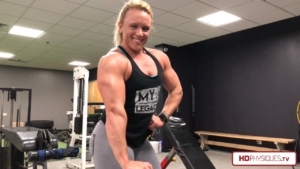 Some Notes About the Week Ahead & NEW Brooke Walker at PremiumPhysiques! Hey Gang! It’s busy times here at HDP headquarters! We’ve got a few things to touch on about the week ahead and some recent things going on at our sister site PremiumPhysiques.com! First up – we are going to have a BIG UPDATE tomorrow in the members section featuring a new model page, PLUS numerous videos/galleries on other pages in the members area. The reason for this abnormally BIG update is because we are not going to update over the weekend like we usually do, because we have a SUPER busy schedule over the weekend filming at the 2019 Arnold Classic. We will be getting tons of hot fresh new content for you. So…. JOIN NOW and don’t miss a thing! So, we’ll update Wednesday, then the next update won’t be until Monday…just giving you a heads up! Then, we have a HOT new model page over at our sister site, PremiumPhysiques! This winter, Brooklyn T. Walker is looking more insanely HOT than ever! We’ve had 4 shoots with her from late December to late Feb…. and the new page at PP will be featuring galleries and videos from all of them. Check out the first 4 videos and first 3 galleries on the 2019 Brooke Walker Winter Shoots page NOW! Remember, you can SAVE MONEY by joining HDP and PP at the same time by using the combo membership. Just use the check box to opt-in for the other site when signing up for either one of them. Finally, stay tuned on Wednesday for NEW videos coming to HDPhysiques.TV, the Female Muscle Store as well! Announcements coming soon – be on the lookout! https://hdphysiques.com/wp-content/uploads/2019/02/Brooke-Dec2018-Dungeon-43.jpg 1039 1500 hdphysiques https://hdphysiques.com/wp-content/uploads/2015/05/logo-300x87.png hdphysiques2019-02-26 23:01:372019-02-26 23:01:37Some Notes About the Week Ahead & NEW Brooke Walker at PremiumPhysiques!